Chalk Art Love <3 ! Hello friends, I am on my way back home today after a fabulous vacation in Virginia with my best friend. 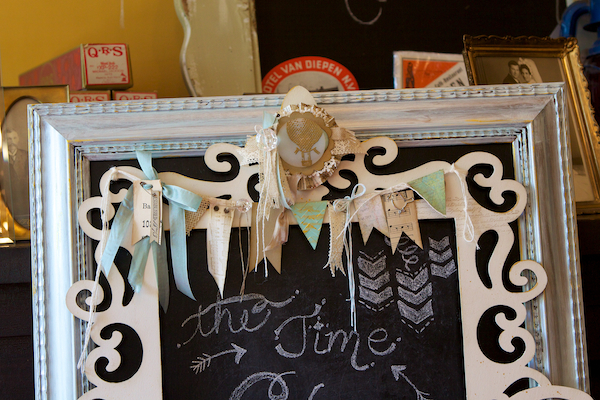 We spent 10 days chatting, creating, venting, shopping, antiquing, stamping, laughing and creating some more! The last couple of days another great friend and a new friend joined us and we went into creativity overdrive! It’s been so inspiring and fabulous, my spirit and soul are full and I am going home with renewed creative energy. We created 32 projects and dreamed up at least another 32 that we didn’t get to! 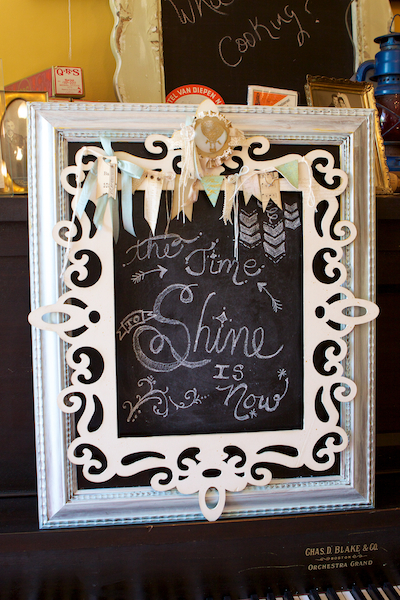 Our biggest undertaking is the chalkboard frame pictured above. We both took Rhonna Farrer’s Chalk Art on-line workshop and have been inspired to learn to make our own chalk art for some time now. We really needed a showcase for our chalk art efforts though! We had a couple of ideas and spent 45 minutes walking down every aisle in Michaels and came home with the bones of the project pictured above. 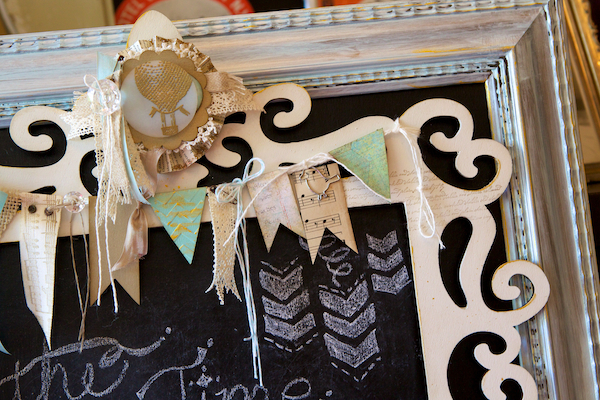 Then we painted & sanded & distressed & sponged & added gold accents & glued this beauty together. It needed some embellishment of course and we spent almost a day collaborating on the beautiful, airy banner and rosette for the top. We used lots of Stampin’ Up paper, ribbon, buttons, etc. as well as some pieces cut from some antique sheet music. I think the end result is breathtaking! You’re Amazing Stamp Set, Established Elegance Stamp Set, This and That Epic Day DSP, Pool Party Seam Binding, Gold Embossing Powder, Brushed Gold Card Stock, Vintage Faceted Designer Buttons, Vintage Trinkets, Pool Party Bakers Twine, Linen Thread, Artisan Embellishments Kit, Natural 7/8″ Cotton Ribbon & Natural 7/16″ Trim Ribbon. Phew! Lotsa goodies on this! Truly this project is over the top and an unusual undertaking, but oh so pretty and fun! A once in a while, special vacation project….just for me! 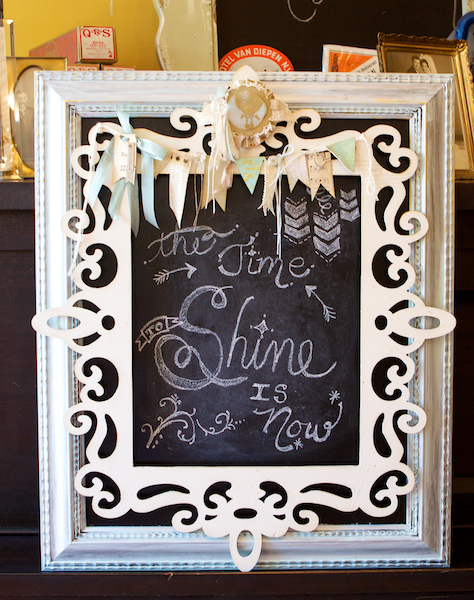 This entry was posted in 3-D, Artisan Embellishments Kit, Chalk Art, Stampin' Up by kate80132. Bookmark the permalink.